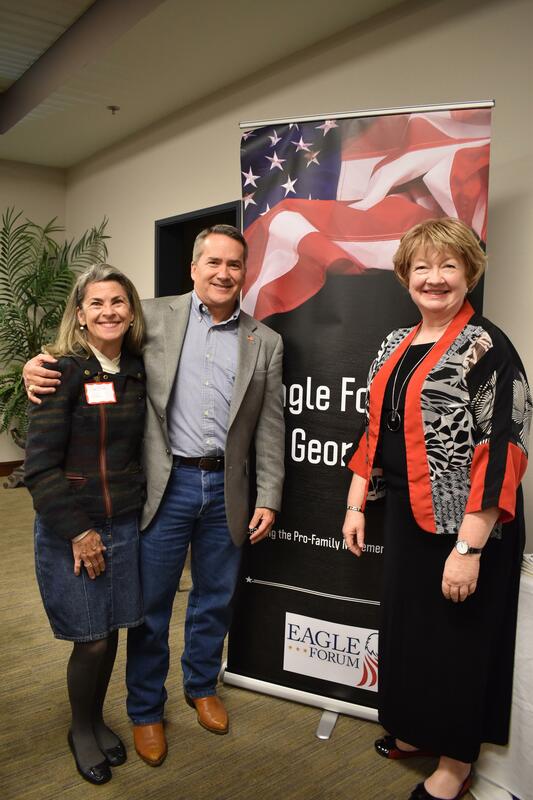 Eagle Forum of Georgia's mission is to enable conservative and pro-family men and women in Georgia to actively participate in the process of self-governance and public policy-making. We hope to provide up-to-date information on state and national issues as well as actions you can take as a private citizen to influence important legislative and executive decisions. Pat has been in leadership positions with a variety of organizations for many years. She worked almost 40 years in college student affairs administration, 18 of which were at the University of Georgia. Her undergraduate degree is from Clemson University, Master's from The Ohio State University, and doctorate from the University of Alabama. She has been active in numerous conservative groups and is past President of Conservative Republican Women of Northeast Georgia. Cathy has been a small business owner and involved politically for many years. Cathy currently serves as the Vice President of Conservative Republican Women of Northeast Georgia, Chairman of the Oglethorpe County Republican Party, and Secretary of the 10th Congressional District of Georgia. The 2018 General Election will be Tuesday, November 6! If you haven't registered to vote, be sure to do so by October 9. Follow the Call to Action button to your right for more information and to find your voting location.